How do I add a Payment Method for SWRemote? Enter the Payment Method name, which will act as your Title. Click in the Payment Type field. Then Click the Box with the 3 Dots. A list will appear. Choose anything from this list, however please ***NOTE! 'CreditCard' will populate in the Credit Card Dropdown, not in the Other. Please choose another Payment Type, preferably "Other". Last but not least, you will need to first push these changes to our servers, and then have the techs "Force Resync" to bring the changes down to their devices. Please follow the instructions found HERE. To make the new Payment Type appear on the Device, they will need to go into the Settings and press Force Resync. Then on the Pay Screen under the Payment Type, Press the Other(a) button. 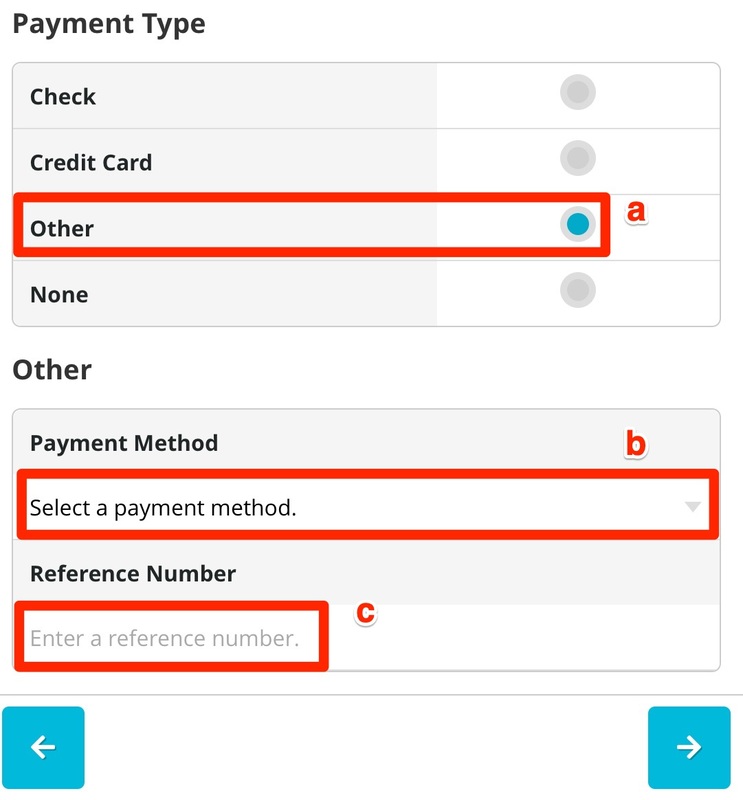 Tap on the Dropdown menu(b) and select the appropriate Payment Method. The Reference Number(c) can be used from 3rd party processing apps, finance payments, etc to help keep track of transactions between 3rd party Apps, SWRemote and SuccessWare21. Note: if you are checking on live Credit Card processing, then you will want to make sure that the "PaymentType" is set to 'CreditCard' for Amex, Discover, MasterCard, Visa, etc.